The anti-gun crowd tends to show their complete gun ignorance with the various arguments they make against guns. Even establishment media, with an anti-gun bias, has repeatedly shown a lack of basic understanding about guns, making mistake after mistake in their reports. Perhaps Hollywood’s movies, laden with unrealistic scenes of gun battles, have contributed to some of the crazy beliefs. Those who have been in actual high-adrenaline, real-life gunfights know better. A homeowner in Houston, Texas, recently showed why some anti-gun crowd arguments are dangerous for those in need of self-defense. It began when his home was invaded by armed individuals seeking to rob him, reported ABC News. 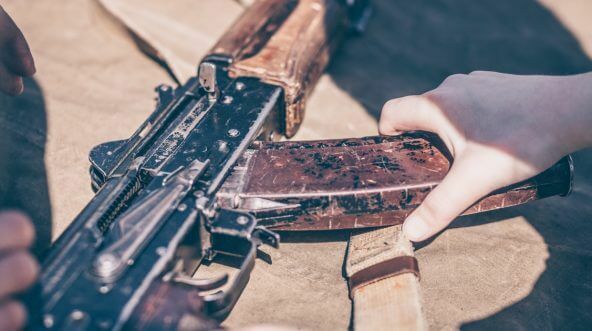 While many may opt to have a weapon such as a shotgun for home defense, this homeowner was fortunate to have chosen an AK-47. While shotguns notoriously hold few rounds, a standard magazine for an AK-47 holds 30. When facing multiple armed intruders, that difference can also be the difference between life and death. The unidentified man’s home was invaded by two men wearing ski masks. When they thought he was reaching for cash to meet their demands, he was instead reaching for his fully-loaded rifle. Gunfire ensued, with both sides firing. Five suspects, some of whom were outside the house, ended up being shot, with at least three deaths reported. They say when seconds count, police are just minutes away. Facing down armed intruders, this man had no time for police to show up to help. Police found shell casings from multiple different types of guns, reported Fox News. The suspects did eventually flee the scene after engaging in the firefight with the homeowner. All five suspects ended up being shot, but the homeowner was unharmed. Police found one of the suspects dead in front of the house that had been targeted. An SUV used by some of the suspects to flee the scene was found crashed into a pole. Inside was a second suspect, deceased. Another suspect who had attempted to flee in the SUV apparently escaped the crash, but collapsed in the street and died later. The final two of the five were also shot and later taken to the hospital for treatment. The semantics of “assault” weapon arguments aside, this case clearly illustrates why, in the case of self-defense, a person could reasonably need a weapon that can hold a high capacity magazine. If all five suspects were armed, how could one person, with maybe a five-round shotgun, defend themselves reasonably? Even when only facing one bad guy, there is are cases where having something like a rifle versus a shotgun can be a good thing. For example, when danger hits, adrenaline can surge through the body. This can have a number of effects, many of which can affect the way even an experienced shooter functions, according to a report from Business Insider. With this in mind, things like sweaty palms, a racing heartbeat, or even shaky hands, can make accurate aiming a little more difficult, which means there would be a need for more than just five or six bullets. Even skilled marksmen can miss their target sometimes. Police can’t show up instantly the second bad guys pull guns. They tend to show up after the fact. If people have the right to protect themselves, their loved ones, and their property, they need a way to do that. What reasonable options are available for people facing multiple bad guys with guns? As this Texas homeowner proved, having the option to own something like an AK-47 can make every bit of difference. Had he pulled out a shotgun instead of his AK-47, the story might have ended in a very different way. BEFORE AMERICANS TAKE BACK AMERICA, THEY SHOULD KNOW WHO TO TAKE IT BACK FROM.